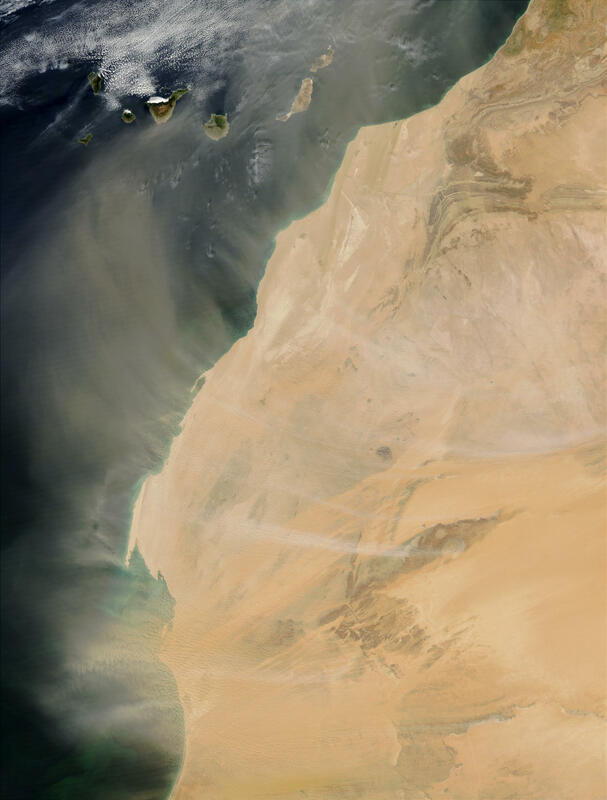 An intense African dust storm sent a massive dust plume westward over the Atlantic Ocean on March 1, 2003. Dust storms and the rising warm air can lift dust 10,000 feet or more above the African deserts and then out across the Atlantic, reaching as far west as the Caribbean, South America, or even Florida. Scientists have linked illnesses, harmful algal blooms in the Gulf of Mexico, and the decline of the coral reefs in the Caribbean to the increasing frequency and intensity of Saharan dust events. These true-color images, acquired by the Moderate Resolution Imaging Spectroradiometers (MODIS) aboard NASA’s Terra and Aqua satellites, show thick dust plumes (light brown) blowing westward over a span of days during the first week in March 2003.